Location: Towards the W end of the High Street. 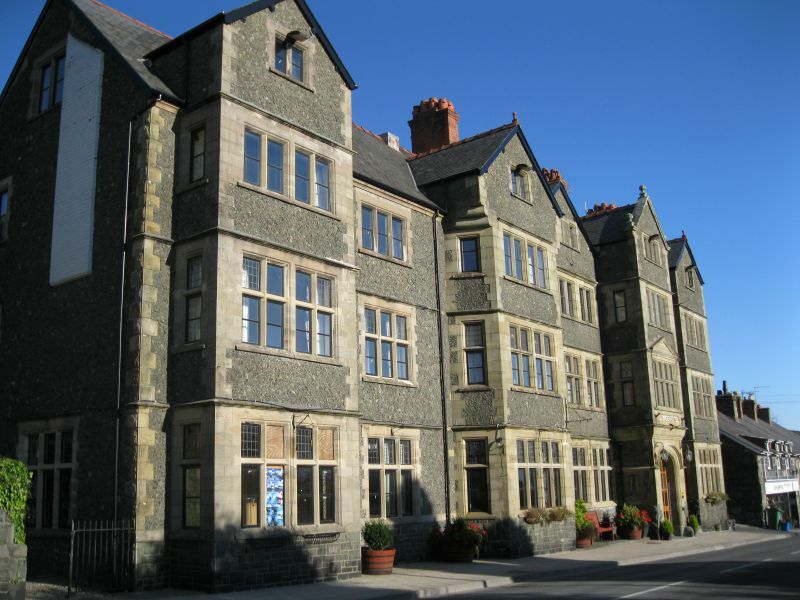 Built as a hotel for the growing resort c1890 (and described in John Heywood’s illustrated guide to Pwllheli and Criccieth of 1897 as ‘a most extensive new house’), on the site of an earlier inn which was in existence by 1839. The hotel may have been designed by John Douglas, architect, of Chester. The 2 westernmost bays are an extension of c1920 in identical style. A large and ambitious building in a Jacobethan domestic style. Main elevation and W gable return are dressed flint with ashlar dressings including bands into which the windows are set; E gable return is roughly coursed and squared rubble; rear service wings are roughcast rendered. Slate roofs with red tiled crestings, end wall and axial brick stacks. 3 storeys with attic, 7 window range. The facade is dominated by a series of full-height bays, which form the windows of the principal rooms and the storeyed entrance porch; the outer bays and the storeyed porch to the right of the centre are rectangular in plan, and there is a canted bay to left of centre. Bays all have paired 2-light mullioned windows on each floor, with transoms to ground and first floors, with decorative leading in the upper lights. Each attic gable has a small 2-light window, and the upper storey of the canted bay is heavily corbelled out to form the gable. Between the bay windows are 3-light mullioned and transomed windows similarly detailed (single light windows on each floor to right of porch). Porch has segmentally arched entrance, and 4-light mullioned and transomed window above with pedimented hood mould. Windows of upper storeys are similar to those in the bay windows. Ball finials to copings of porch gable. Continuous hood mould bands to ground and first floor windows, the hood moulds of the upper storey windows continuing as moulded eaves cornice over the intermediate bays. Original layout survives largely intact, though much of the interior detail has been altered. There is a fine open well cantilevered staircase, with arcaded galleries to landings. Dining room in extension of c1920 has smooth oak wall panelling with bracketted plate rail or cornice. An excellent example of a purpose-designed hotel of the late C19-early C20.